Hi, I am interested in your 1972 Chevrolet Corvette (stock #1320-NSH) listed on Autotrader for $21,995. I'd like to get more information about this vehicle and confirm its availability. 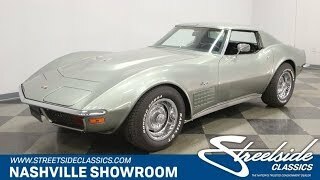 1972 was the last year model Corvette ever built with a chrome bumper at both ends. They went to the molded front bumper in 73, and by 74 they were both gone. This is a good looking, nice driving car offered at an attractive price that should leave room in the budget to plan some adventures with it. Come on down and check it out. Steel Cities Gray is a great color, and if you have a friend in Pittsburgh that has been hankering for a Vette, give them a call. It received and mid-life respray and still looks good as it highlights the fender flares and graceful curves of the body. There is a power bulge in the hood and crossed racing flags between the hideaway headlights just in front of it. The front fenders have Stingray in script above the body line with air vents just below it. The rocker panel is trimmed out with a bold piece of polished stainless and T-roof panels can be removed for open air touring. Long sail panels taper down to the rear deck between the back fenders and it all flows together nicely and turns up in an integrated rear spoiler. Four round taillights have Corvette lettered between them and those precious chrome bumpers flank a chrome license plate surround. Open the door and you will find a nice comfortable Black interior that is in good shape. The molded door panels have a bit of wood grain trim outlined with chrome piping just over the long armrest. A three-spoke deep dish steering wheel is mounted on a tilting and telescoping column with a crossed racing flag horn button. Behind it is a stock dash with the tach on the right, and a 160 MPH speedo on the left. A clock as well as a fuel gauge, water temp, oil pressure and volt gauges are mounted in the center just above the factory Corvette FM radio. Below that are the ventilation controls and a shifter for the automatic transmission in the center console. The high back bucket seats have been recently recovered and are pleated in the center with smooth side bolsters. Flip those forward and you can slide the roof panels in behind them when the mood strikes for pop top motoring. Under the hood you will find a completely stock motor tucked down in the engine bay. A chrome air topper has a 350 Turbo Jet decal on it and it feeds a Rochester 4-barrel carburetor that flows through an aluminum intake manifold to the cylinder heads. Ribbed aluminum valve covers look good and help with oil cooling. The alternator is newer and there is a fresh aluminum radiator to keep things running cool. Power flows back through a 3-speed automatic transmission to the wheels through an independent rear suspension with transverse leaf spring. Up front control arms and coil springs along with a beefy sway bar work together with power steering to provide great handling. Power front disc brakes provide good stopping ability and the rubber meets the road through 255/60/15s all around mounted on stock steel wheels with trim rings and center caps. This good looking, nice driving, last of the chrome bumpered Vettes could be yours. Come on down, take a look and see what you think. Then start planning your adventures with it.